Climate change can interact with local stressors. A recently logged forest in East Kalimantan may become vulnerable to erosion if climate change leads to increases in heavy rain. 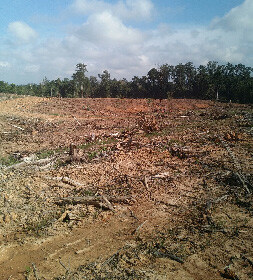 This land was cleared to make way for a pulp and paper plantation. (Photo by Rebecca Runting). Most of us worry about climate change in one way or another, but not many of us explicitly consider how it will be impacting the ecosystem services we rely on. Maybe that’s because ecosystem services themselves are often taken for granted or undervalued, as we expect services like clean air and water to be perpetually available. However many of the decisions made, such as the ongoing emissions of greenhouse gases, threaten the provision of numerous ecosystem services. Different approaches to managing ecosystem services are being developed to deal with this problem. But how well do these approaches engage with climate change? The fact is that climate change is having a substantial impact on ecosystem services, yet many assessments don’t link to our decision-making processes. Integrating climate change into assessments and planning for ecosystem services is vital if we are to avoid poor management decisions. For example, coastal land-use zoning that ignores the effects of sea-level rise could lead to a long-term decline in ecosystem services, such as flood protection, provided by coastal wetlands (I explored the connection between coastal wetlands, ecosystem services and rising sea level in Decision Point #97). To add to the challenge, climate change doesn’t impact ecosystem services in isolation, it interacts with other local or global stresses on the environment. Land-use change, population growth and pollution, for example, all create their own stresses and will interact with the impacts of climate change. For instance, a logged forest could become more susceptible to erosion if climate change leads to increases in the intensity of rainfall. So, what is the state of our understanding of the connection between climate change and ecosystem service assessment? We did a review of the scientific literature to see if we could identify important gaps. There are many studies of individual cases of climate change impacts on ecosystem services, but our review provides the first quantitative synthesis on this topic. What did we find? A regional bias: First up, most of the papers that were identified in our review came from the USA or Europe (Figure 1), so there is a clear need for more studies beyond these regions, particularly in South America, Asia and Oceania. This is particularly important as these regions generally have a lower capacity to adapt to the impacts of climate change (see Decision Point #97). (This reflects other reviews of the research effort on conservation science related issues. Kerrie Wilson and colleagues, for example, found that most of the biodiversity conservation research was not being done in the places it was most needed, see Decision Point #98). nation. Each study could span more than one nation. 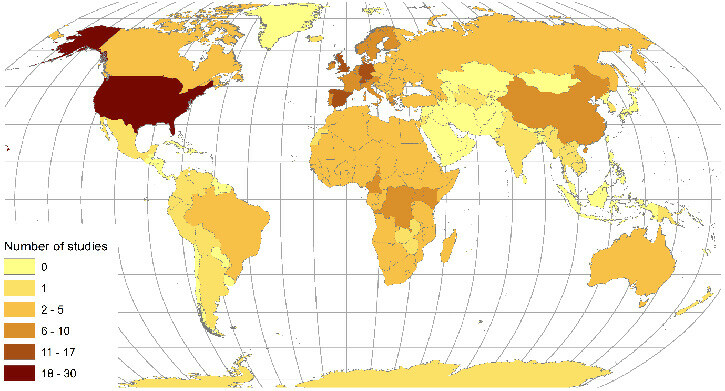 The USA and Europe dominate the academic literature. Mostly negative, some positive impacts: While climate change generally has a negative impact on ecosystem services, the news isn’t all bad (59% of the analyses reviewed showed negative impacts, 24% mixed, 13% positive, and 4% neutral). For instance, as temperature and the concentration of carbon-dioxide increases, carbon storage is increasing in some places, particularly higher latitudes. Expert bias: We found that using (only) expert opinions to determine the impact of climate change can overestimate the negative impacts on ecosystem services. Almost all studies that used expert opinion to determine the impact of climate change produced negative results (94% negative, 5% mixed, 2% neutral). In contrast, only 47% of studies using computational models, or experiments in the laboratory or field found negative results. The overestimation of negative results produced by expert opinion could be explained by ‘accessibility bias’ – the knowledge that the impacts of climate change are generally negative can disproportionately influence the judgment of the experts (even in cases where the impacts may be positive). This suggests that we should make more use of techniques that minimise bias and corroborate the information provided by experts (see Decision Point #93). or decision making in addition to climate change. Interactions exacerbate negatives: Climate change interacts with other stressors on the environment, such as land use change. Where a stressor in addition to climate change was included, 62% of analyses were negative. Therefore, it is important that we do not consider climate change in isolation when making management decisions (see Decision Point #72). 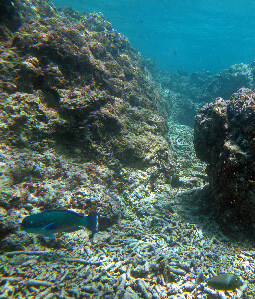 Damage to Beaver Reef (up on the Great Barrier Reef) after Cyclone Hamish in 2009. The Great Barrier Reef provides a raft of ecosystem services to Australia and is under threat from multiple stressors. Storm frequency and bleaching events are related to climate change but these stressors interact with the damage caused by Crown-of-Thorns starfish, outbreaks of which are connected to nutrient outflows from adjoining agricultural catchments. Such interactions are essential in assessing the impact of climate change on ecosystem services. Uneven attention to uncertainty: Some degree of uncertainty was usually incorporated in the assessments (71%), but this was usually surrounding the magnitude of climate change and other drivers, with very little attention given to the uncertainties associated with how ecosystem services are modelled, or the mechanisms by which the services were impacted by climate change. Relatively few studies (29%) integrated any kind of decision making (management actions, policies or other interventions), and even fewer studies aimed to make decisions that were robust to uncertainty. 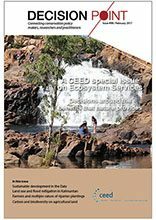 These results tell us that if management or policy decisions are to ensure the continued provision of ecosystem services, then an integrated approach is needed. Such an approach must include multiple threatening processes and account for multiple sources of uncertainty. This is definitely not an easy undertaking, but ignoring these complications could misrepresent the true impacts of climate change, and result in poor outcomes for climate adaptation decisions.